It seems I have been noticed over at NBNco, not surprising granted that I have lodged a couple of Freedom of Information requests to them regarding the Rollout Progress of the network. It is not as if I am completely unknown to NBNco, I am sure there is a few people there that know of me, especially their social media team as I do participate in the Whirlpool community and publish a Consolidated ‘Ready For Service’ Plan each month which tracks the changes month to month as various sections of the fibre rollout get delayed, brought forward or otherwise changed. 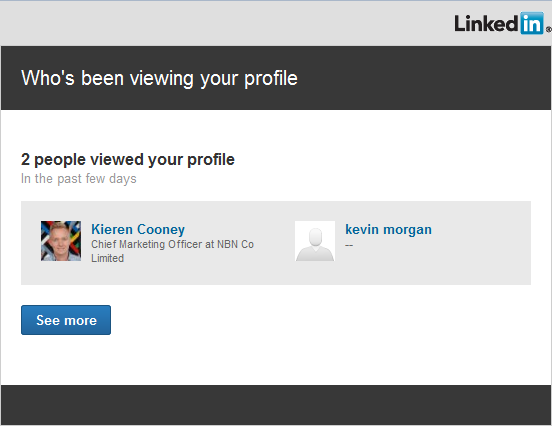 Imagine my surprise this morning to get an email from LinkedIn saying that Kieren Cooney – Chief Marketing Officer at NBNco no less – had checked out my LinkedIn profile. Talk about know thy enemy! Makes me wonder if I am now deemed an enemy combatant, or someone that the NBNco Stasi need to keep an eye on and make disappear at some point. It’s not every day you get a C-level taking a look at your LinkedIn. Kieren, if you do read this – you can say hi via Twitter, Facebook, Whirlpool, OCAU, or drop me an email. No need to LinkStalk me. That said, if you are looking to headhunt me then LinkedIn message is the way to go.